This year’s Mental Health Awareness Week theme ‘Thriving or Surviving?’ is a reminder that good mental health and wellbeing is about more than the absence of a mental health problem, but the opportunity to live a full and meaningful life. This means more than simply ‘getting by’, or managing symptoms of mental distress, but supporting people to thrive and flourish – develop positive resources for mental health such as resilience, social support, and a healthy and fulfilling lifestyle. There is a stigma-busting message here too – people with mental health problems, including those which are severe and enduring, can also thrive. Mental health support has progressed considerably from the days when treatment was focused only upon medical symptoms and survival in terms of people barely managing, or not being ‘in crisis’. However, this narrow approach to mental health still exists, particularly for those who are the most unwell. There continues to be low expectations for such people that they will ever be able to thrive. These issues are present in wider society: as the Mental Health Foundation’s new report this week reflects, too few people are thriving in the UK. If we’re going to change this, at McPin we suggest the need to develop new asset-based tools which focus on people’s strengths and personal opportunities as well as resources across communities all around us, and we need research evidence on what does and doesn’t work. At McPin, we have been working on an asset-based approach to mental health that we have called ‘Personal Wellbeing Network Mapping’. From 2011 to 2015 we conducted research funded by the National Institute of Health Research (NIHR) that mapped the social networks of people diagnosed with schizophrenia, bipolar disorder or psychosis. Our social network mapping approach was unique: we extended the approach to map not only people but places and meaningful activities too, and we asked participants to rate the impact of these on their wellbeing. 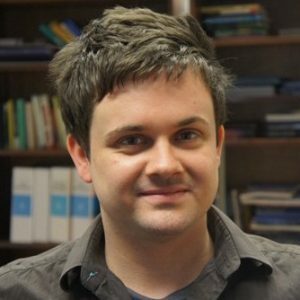 We reported that the people in our study had a wide variety of wellbeing assets in their lives with some having thriving and active networks of resources that helped them have good mental health, contrary to popular preconceptions about people who are diagnosed with mental health problems. We also found that there was potential to help people actively manage and build on these wellbeing connections, with some initial evidence that the tool we used to collect data could be used in practice. We found some of the people in our study had already started to make changes to their networks as a result of mapping their connections, by the time we met them a second time. There is now plenty of evidence that social networks are vital in helping people to maintain mental and physical wellbeing, as well as to recover from ill health. Traditionally, mental health services have not had a role in helping people manage their social worlds, but this is changing with recognition that people who are most unwell are often isolated and find it particularly difficult to maintain or build new social relationships. Our approach could help identify opportunities to support people to address social challenges in their lives, through mapping community assets that support social connection as well as meaningful activities, interests and places around which people can build new social networks. Two years on from the end of this study, we’re beginning to see progress towards using this method in practice. We are working with a variety of partners who are testing our approach as an asset-based intervention to help people thrive and with others who are doing work inspired by the methods we used. 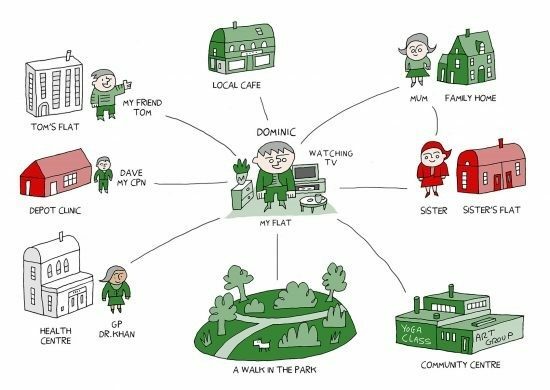 Our Community Navigator study is testing an approach to help people with anxiety or depression increase social connections, while in Hounslow a Wellbeing Network has been created that offers our mapping tool to members who join and identify social isolation as a challenge. Our colleagues in the Institute of Psychiatry, Psychology and Neuroscience are using our approach as the starting point for an intervention to help people with enduring mental health problems to improve their physical health. We are bringing together these partners on Wednesday 10th May to discuss how we can learn from each other. How is wellbeing mapping being used in practice? We hope to collectively take forward ideas to improve our approach, creating insights that might benefit other groups such as people leaving secure care. An open-access journal paper will soon be published in which we describe the methods, concept and some of our key findings using our personal wellbeing networks approach. Stay in touch to find out when this is published and to keep up to date on our work on this topic.